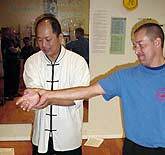 Dr, Yang demonstrates a painful Chin Na grasping and controlling technique during a seminar on this subject held in Boston. Editor’s Note: This is the second in a two-part article on Chinese Chin Na. In Part 1 Dr. Yang discussed a number of Chin Na aspects including the need for speed and power to execute techniques and maintain control, and the importance of controlling an opponent completely. It Part two Dr. Yang discusses about how to escape from an opponent’s Chin Na technique and how to counter Chin Na grabs. Chin Na literally means "seize control." Chin Na covers a wide range of defensive and offensive techniques, from very fundamental hand grappling to the very advanced Dim Mak (delayed death touch). The fundamental techniques can be learned by any martial artist or even by someone without any martial arts experience. These fundamental techniques can easily be adapted and incorporated into any martial style such as Judo, Wrestling (Shuai Jiao), Karate, or Tae Kwon Do to increase the range of responses. Dr, Yang demonstrates how to escape a Chin Na technique as it is being applied. When you neutralize an opponent’s grabbing attack, it is important to remember to neutralize it in such a way that he cannot immediately continue his attack with another technique. Usually, when you rotate out of a grab, you will pull your hand back as soon as possible, but while you do so you must prepare to deal with a possible punch if your opponent tries to continue his attack. Pressure release escape is the natural reaction of your body to pain. The principle is very simple. When your opponent tries to control you with Chin Na, before he completes his control, you simply use your other hand to grab the opponent’s fingers or hand that is causing you the pain. This pressure release technique is commonly used in Chin Na counterattack. In this case, right after you have released the pressure, immediately change your grab into a Chin Na technique. Therefore, pressure release escape can be practiced only with a partner. 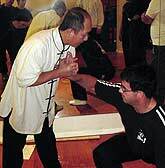 Dr, Yang demonstrates an escape to an opponent’s grab before applying a counter Chin Na technique. Generally speaking, it is harder to counterattack against a grabbing Chin Na than it is to attack with a grabbing Chin Na. This is because when you attack you make the decision what technique to apply, whereas when you counterattack you are responding to another person’s attack, and your actions are determined by, and limited by, the technique he applies. Therefore, in order to be able to counterattack against a grabbing Chin Na, you must know what your opponent is doing and what your possible actions are. Not only that, it normally takes less than one second to apply a Chin Na, so you have probably one third of that time to react. In order for you to react naturally and skillfully, your technique must be much higher than the attacker’s. 1. Always consider escape first and counter second. You must save yourself first before you can counterattack. It cannot be denied that sometimes a counterattack is the best way to escape. However, you should train yourself to escape first, and once you have developed your reactions enough you will find yourself counterattacking naturally when it is appropriate. 2. If you are not sure you can use a grabbing Chin Na for your counterattack, do not use it. Punching or kicking counterattacks are much easier, faster, and safer than grabbing Chin Na. 3. When you use a counterattack, you must react before you are completely controlled. 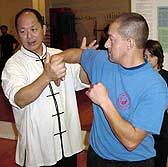 You should understand that a perfect grabbing Chin Na control is very fast and effective when done by a Chin Na expert. Once you are controlled completely, you will not have any chance to escape. 4. The crucial key of a successful counterattack is following the opponent’s motion and then changing the angle. If you resist at the beginning, you will have set yourself up for your opponent’s locking. However, if you follow his motion, it will become difficult for him to lock you in the angle he desires. This will also provide you an opportunity to change the angle of his locking and lead him into your trap for your counterattack. When you are in a fight, you should immediately seize your opponent’s will, confidence, and fighting spirit. This is spiritual Chin Na. This means that at the beginning of a fight you should use your spirit and confidence to discourage your opponent and make him lose his fighting confidence and spirit. Usually, this spirit and confidence is shown on your face and in the way you look at him. From your eyes and face, your opponent can sense your spirit of vitality, your courage, your confidence, your calmness, and subconsciously, even your Qi capacity and will power. If you can conquer your opponent with this first visual and mental contact, then you have reached the highest level of Chin Na -- to seize the opponent’s fighting spirit. Remember: the highest fighting art is to fight without fighting. Acknowledgement: Photo in the article were supplied by Christopher Caile, Editor of FightingArts.com. Dr. Yang is also the founder of the YMAA Retreat Center in Humbolt County, CA, where he will spend ten years training a select group of students, starting in August 2008.